In your eye, Bernie. - Wisdom is the retention of innocence through adversity. The Virgin Mary shoots milk at Saint Bernard, 1146. 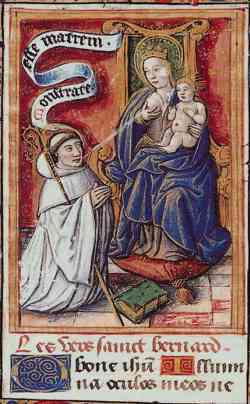 Saint Bernard of Clairvaux was largely responsible for reviving the Crusades, (which eventually fell apart). He is not be confused with the other famous Saint Bernard (of Menthon) who is known for the giant dog.